The Internet, the greatest wonder of the modern world, billions of people electronically connected through computers, smartphones and miriad of electronic devices, in it's short life the Internet has evolved into a virtual universe where you can have your own little place, be it on a social network, homepage or a blog and where you can say what you want and share your opinion freely with the whole world. Did I say freely? That could soon be history, that's the impression many users across the Internet are having now. The reason is called 'Article 13', a copyright reform that proposes the use of 'upload filters' to check the users's content before it is uploaded to a website. What does it all mean? In a nutshell it means If the content the user is uploading contains copyrighted material, the filter won't allow it to be uploaded and/or published. While the European Union hopes this way to strengthen the rights of authors, many critics and users see it as a censorship and a violation of freespech. Should article 13 be validated, we can already say goodbye to what has become a lifestyle and the reason for endless laughs, discussions and shitstorms on countless websites: memes. Why will memes dissapear? The answer is quite simple: memes are made of images, videos and GIF files, material for which someone else usually holds copyrights on. Reddit reacted one week before the legal committee in the EU voted, for this purpose they told european users to contact MEPs directly in order to protect the free and open Internet. In 4chan, another well know meme site, the discussions weren't as hot as in Reddit, but in many threads the discussion went around the end of memes and thus the end of meme sites. Imgur, a platform that many use as meme storage, took a funnier aproach to the subject: They can take our money and our privacy, but they will never take our memes! One example of the unreliablity of such filter is already being in use for years, YouTube has invested over $100 millions as of 2018 in their ContentID system which is the most expensive and advanced copyright filter to date and basically a 'small' version of what article 13 could become. This article by Mike Masnick explains in detail how YouTube's filter works and why such systems bring more problems than benefits to the users. So what does Article 13 really mean for the web? First of all, click here if you want to sign an online petition against article 13. While the vote in the Legal Affairs Committee is an important signal, is not yet a final decision. The voting in the European Parliament will probably take until at least the end of this year. Another unanswered question is how well such filters work, because they must be able to recognize any copyrighted material and that won't come in cheap. To this day, they are far from perfect and legally harmless content is blocked while questionable content slip through the net as if there was no filter at all. Moreover, it has not yet been clearly defined for whom the rule applies. While some say it should be only targeted to companies that store large quantities of data and make them available to the public others want it to be on every site and filter all content which is being uploaded. Whether the controversial article 13 really comes and whether Reddit, 4chan and co. then will have to filter content and thus the end of all Memes begins, is not yet decided. Accordding to HBO's documentary Leaving Neverland, Michael Jackson was sexually involved with two children and sexually abused them on a daily basis for years. Both kids, now adults, talk about how they played 'games' with Mr Jackson, showered together and did other things which i don' find worth mentioning here. My first question is, why do they start talking about it some 30 years later and didn't say anything right away when Mr Jackson touched them (if he actually did) for the first time? Furthermore, why did their parents allow this in the first place? What parent trust their children to be alone and sleep in the same bed with an adult man that they basically didn't know? Michael himself was abused by his father, and everyone knows it, he was himself robbed of his childhood and couldn't enjoy playing out in the dirt with other kids and grow up like most of us did, he didn't have a chance to enjoy being a kid, and that haunted him his whole life. So let's add it all up and think carefully about it, would you as a parent leave your child alone with a grown man who you know was himself abused as a child? My final thoughts are, is it really worth it? Does it make sense now after Jackson's death to bring all this up? Whose fault is it really? Is it Michael's fault? The kids's parents for leaving their children with Michael alone? Guess we'll never really know, I won't waste my time watching the documentary, if you do watch it and wish to share your opinion with me leave a comment below. I am, and I've always been a metalhead and I never payed much attention to pop music, but you just couldn't grow up in this lifetime without knowing Michael Jackson, be it the moonwalk, some awesome bass line, Thriller or simply his out-of-this-world songwriting skills, this man was / is and will always be the foundation of pop music as we know it. R.I.P Michael, you were one of a kind. 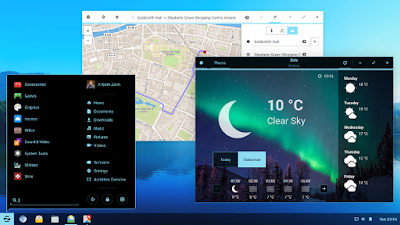 Zorin OS, test drive and experience. After testing Elementary OS I though I would take a break from distro testing and concentrate on my next project, unfortunately my geek heart just can't stand still so I started to look for another test candidate, this time is Zorin OS to show what it can. 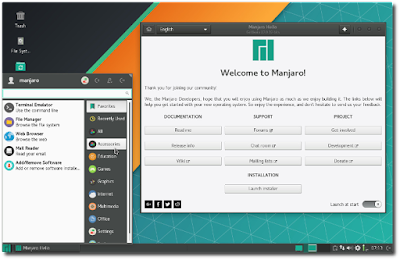 Tagged as 'One of the best Linux distros available' and 'Best replacement for both Windows and Mac' it sounded very promising so I downloaded the latest release, made a bootable USB stick and I was ready to test. First impresion is a very clean, Gnome powered, friendly and for those coming straight from a windows enviroment, very familiar desktop which reminds a lot to Win xp or Win 7, alternative you have the normal Gnome desktop in the Core version and the Ultimate version offers a Mac and a Unity like desktop enviroments plus a few more goodies which are not included in the Core version. The default Zorin OS desktop. Under the hood is Ubuntu 16.04 LTS, which means stability, long time support and 5 year updates. A big plus from Zorin was setting up my printer. I have a HP multi-function device connected to our home network via wlan, Zorin found it within seconds and in less than 2 minutes i was all set, it was even easier than setting it up on windows! 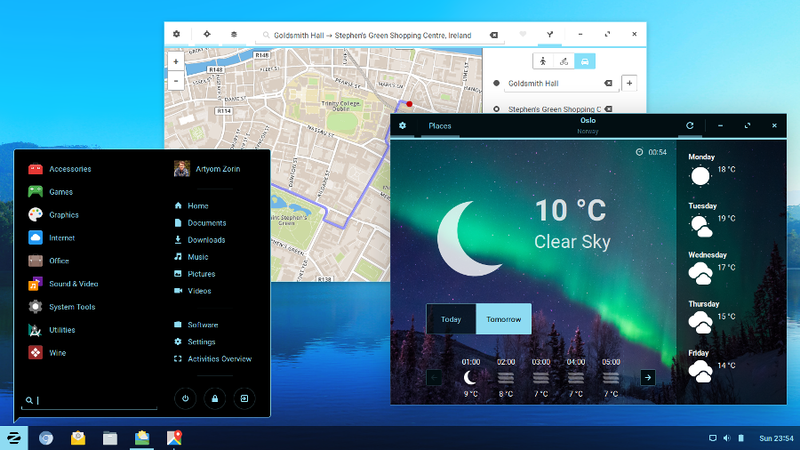 In a nutshell, ZorinOS is a good looking, stable and fast Linux operating system which is worth a try.